The Australian Army is currently looking for replacements of the ASLAV and M113AS4 armored fighting vehicles (AFVs). Phase 2 of the LAND 400 program seeks a replacment for the 13.2 tonnes ASLAV. The ASLAV is used by the Australian Army as scout vehicle, armored personnel carrier (APC), command vehicle, armored ambulance and also as support vehicle. It is either armed with a 25 mm Bushmaster chain gun (in case of the ASLAV-25 scout vehicle) or with a heavy machine gun on a pintle mount or on a Kongsberg remote weapon station (RWS). It transports up to either six or seven soldiers depending on version. Unlike current American and Canadian LAV versions, the ASLAV is only protected by thin steel armor providing protection according to STANAG standard 4569 level two or three. 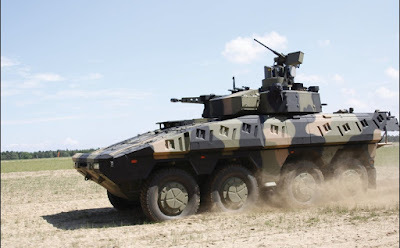 Currently there are four contenders to replace the ASLAV: The AMV 35 CRV from Patria and BAE Systems, the LAV (CRV) from General Dynamics, the Sentinel II from Elbit and ST Kinetics and the Boxer CRV from Artec (a joint-venture between Rheinmetall and KMW). 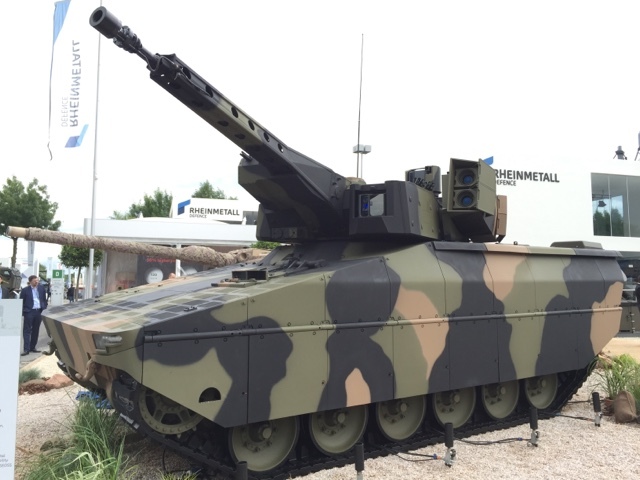 Originally more contenders including Raytheon and Nexter (offering the VBCI with French T40 turret) were looking for a LAND 400 Phase 2 contract; after considering their chances of meeting the Australian requirements - in particalur the military-off-the-shelf (MOTS) requirements - they withdrew. While the offer from Patria and BAE Systems - consisting of a Patria AMV fitted with the E35 turret of the CV9035 - was known very well for the past weeks, a lot of new details have emerged on the other contenders. 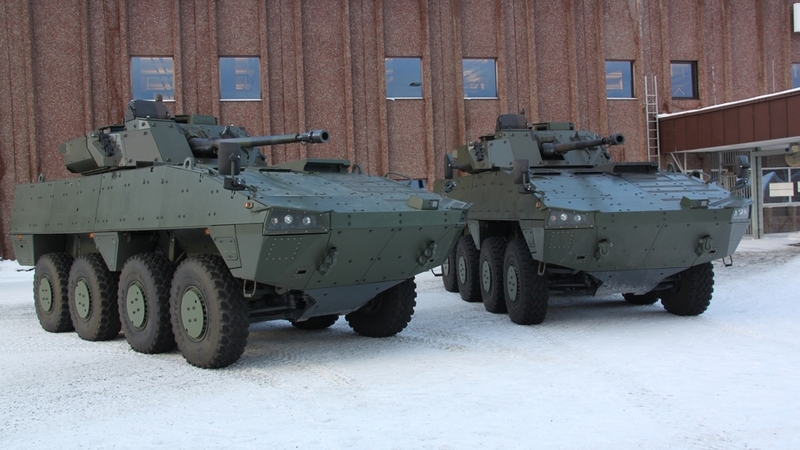 Supposedly Patria isn't offering the latest AMVXP with increased payload and performance, but the a version of the original AMV hull with higher compliance with the MOTS requirements. As far as the other contenders are concerned, first and foremost of there is the LAV (CRV), a version of the Canadian LAV 6.0 upgrade modified to meet the Australian requirements. The LAV 6.0 itself is a modified and upgraded version of the old LAV III infantry fighting and scout vehicle. The LAV (CRV) has the lowest gross vehicle weight of all contenders, sitting at just 28,600 kg. It is fitted with the unmanned MCT-30 turret from the Norwegian company Kongsberg. It features 8 smoke grenade dischargers (in 4 banks of 2 each), the Mk 44 Bushmaster II gun chambered in the 30 x 173 mm caliber from Aliant Techsystems (ATK), a low-profile version of the CROWS RWS and a laser warning system. An interesting side note is that the MCT-30 turret is fitted with the WAO sight from Airbus Defence, which is also used on the German Puma IFV. The US Army prefered to use a different - supposedly cheaper - sight unit for their Stryker upgrade with the MCT-30 turret. The fully stabilized WAO includes a daylight camera, a thermal imager and an eyesafe laser rangefinder. The LAV (CRV) is also fitted with a 360° surveillance system consisting of three cameras. One is mounted on a mast above the rear ramp, while the other two are located on the frontal hull section. It uses a double-V hull desgin (like the late generation Stryker ICVs of the US Army) for advanced protection against mines and IEDs. For ballsitic protection the LAV (CRV) is fitted with ceramic composite armor on top of it's steel hull. However the ballistic protection of the LAV (CRV) is not able to keep up with the competition, offering only protection according to STANAG 4569 level 4 (all-round protection against 14.5 mm armor-piercing ammunition from 200 metres distance) on the hull. The turret is even less armored, not able to meet the level 4 requirements. According to General Dynamics the vehicle can be fitted with special deployment kits for increased ballistic protections, but this is expected to negatively affect mobility and payload, thus taking away the plattforms growth potential. The Sentinel II has been a mysterium for quite a while, but ST Kinetics and Israeli company Elbit Systems have showcased their vehicle solution to the public for the first time. It is based on the current Terrex 3 vehiclee from ST Kinetics, but numerous technologies and components from Elbit and it's partners have been utilized. Frankly, due to the Terrex 3 being originally designed for high performance on water during amphibious operation, which are not possible with the heavier Sentinel II. The Sentinel II is fitted with the MT 30 (Manned Turret 30) from Elbit. This turret can be used in either manned or unmanned configuration and is equipped with a 30 mm Bushmaster II chain gun, a co-axial machine gun and a pop-out dual-launcher for Spike ATGMs. Like all other candidates, the vehicle is fitted with a digitial fire control system and stabilized gun to enable accurate firing on the move. The commander is provided with Elbit's COAPS (Commander Open Architecture Panoramic Sight), which includes a thermal imager, a CCD camera and a laser rangefinder. The gunner is provided with a similar set of optronics.Two banks of four smoke grenade dischargers are mounted on either side of the main gun. Ontop of the turret two launchers of the new Iron Fist LC (Light Configuration) from IMI. This active protection system (APS) was first presented at Eurosatory 2016 and is a scaled down version of IMI's already existing Iron Fist APS. It launches a high explosive (HE) grenade onto an incoming threat that has been spotted by the radar. While the original version of Iron Fist has some anti-APFSDS capability (when the HE warhead fuzes at the right time, it can cause the APFSDS to tilt), the light configuration uses smaller warheads that are most likely inable to affect APFSDS. With only four interceptors ready for defeating RPGs and ATGMs, the Iron Fist LC is not suited for longer engagements, but is a useful asset in assymetrical warfare. At the front and the rear of the turret a total of four laser warners are installed. These can detect when the vehicle is lazed by a rangefinder or beam-riding missile and may be connected to the APS or the smoke grenade dischargers. A camera system located at the hull provides 360° close-range vision of the near terrain. 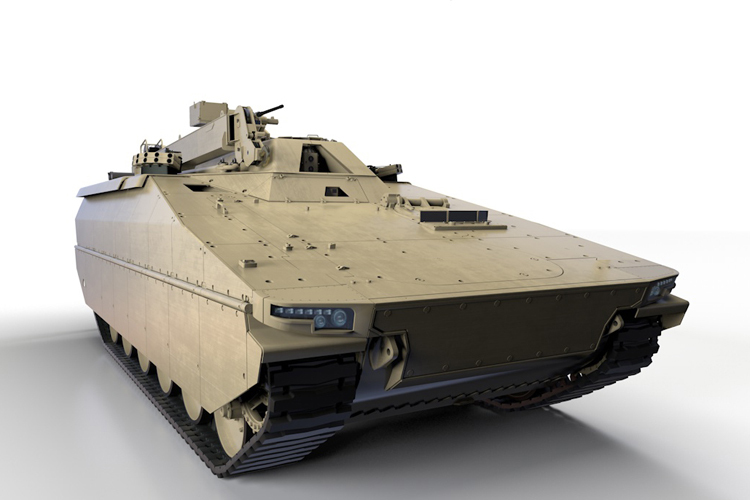 The implementation is quite reminiscent of Rheinmetall's SAS 360° system, which has been installed on the Boxer CRV and other vehicles such as the Advanced Technology Demonstrator tank. It consists of three sets of each three cameras, that are set at different angles. On the rear there are only two cameras, while a further camera is located at the frontal hull - these cameras are possibly meant for the driver only. While it is possible to boost the protection level to the levels protect against 25 mm and 30 mm ammunitions, this is only possible at certain, limited areas and not along the whole frontal arc like required by STANAG 4569. Furthermore this requires to reconfigure the turret into an unmanned configurations and reduce it's armor protection to STANAG 4569 level 2 only - which means being vulnerable to 7.62 x 51 mm NATO AP ammunition or equivalent and larger calibers. A designated marksman rifle or battle rifle would be enought to penetrate the armor and potentially knocking out the Sentinel II's weapon systems by damaging the fire control system, ammunition feed system or turret drives. Due to being designed as a manned turret, the MT 30 is not optimized for unmanned operations and wastes a lot of space and thus valuable weight, that could have been used for increasing the protection. Overall the Sentinel II has three major drawbacks. The lackluster armor protection does not manage to meet the Australian requirements. Also the missile launcher is not decoupled, so that vibrations will be passed onto the missiles. On the long term this will cause issues as the missile can be damaged or rendered completely used in a not decoupled launcher, so the Spike ATGMs in Eblit's MT 30 turret would need to be stored at other places and only be fitted into the launcher before going to battle/on a mission. The biggest problem of the Sentinel II is that it seem to completely fail the military off the shelf of the Australian Army. It seems to be an agglomeration of unproven and new parts: the hull is taken from the new Terrex 3, which is still unproven and not in service with any nation. The turret is a new design that has yet to be used on a series produced vehicle. Even the large version of the Iron Fist APS has yet to be fielded on a tank or any other type of vehicle - the brand new Iron Fist LC version is even more of a risk. Arguably the only proven systems are the laser warners, the COAPS sights (which have been chosen for the Argentinian TAM upgrade), the smoke grenade launchers and the Bushmaster chain gun. Previously some basic infromations on the Boxer CRV have been written here aswell, thus only the newest developments seem to be worth mentioning. Photographs of a Boxer CRV with new features have been published on the internet. The Boxer has been fitted with a version of the ADS (Active Defence System), formerly known as AMAP-ADS. In the configuration as used on the Boxer CRV it includes at least 26 sensor units (maybe even more if the rear is also protected by ADS). Unfortunately this version of ADS appears to be incorporated into the additional armor modules on the side of the vehicle, which doesn't allow accurate counting of the exact number of ADS countermeasures; usually there is at least one countermeasure per sensor unit, in some cases even two. ADS is capable of intercepting RPGs and ATGMs in all known versions, while the heavier versions are also capable of defeating explosively formed penetrators (EFPs) and large caliber APFSDS ammunition. With an estimated 26 countermeasures, the ADS on the Boxer CRV is much better suited for longer combat operations than the Sentinel II with it's Iron Fist LC APS, however restocking the ADS might take longer. The Boxer CRV also has been fitted with a dual launcher for Spike ATGMs, which is in contrast to the Sentinel II's launcher decoupled and allows long-time storage of the missiles directly in the launcher. A new RWS fitted with a 12.7 mm M2 Browning heavy machine gun is located on top of the turret. Unlike most other types of RWS, this specific one does not have an own set of optics, but is rather slaved to the commander's periscope located on top of the turret. Such a weapon station design design was used on some other vehicles already, most noticable the Russian T-90MS main battle tank. Rheinmetall calls this a "killer-killer" functionality (in contrast to the hunter-killer functionality) and claims that this an unique feature of the Lance MTS among medium calibre turret thanks to the so called "Main Sensor Slaved Armament" (MSSA) technology. Most likely the RWS can be folded down, otherwise putting it on the Boxer CRV turret wouldn't make much sense, as the commander's sight was specifically modified to be retractable in order to reduce the overall height of the vehicle. A rather curios move was made by Rheinmetall for the Phase 3 offering. 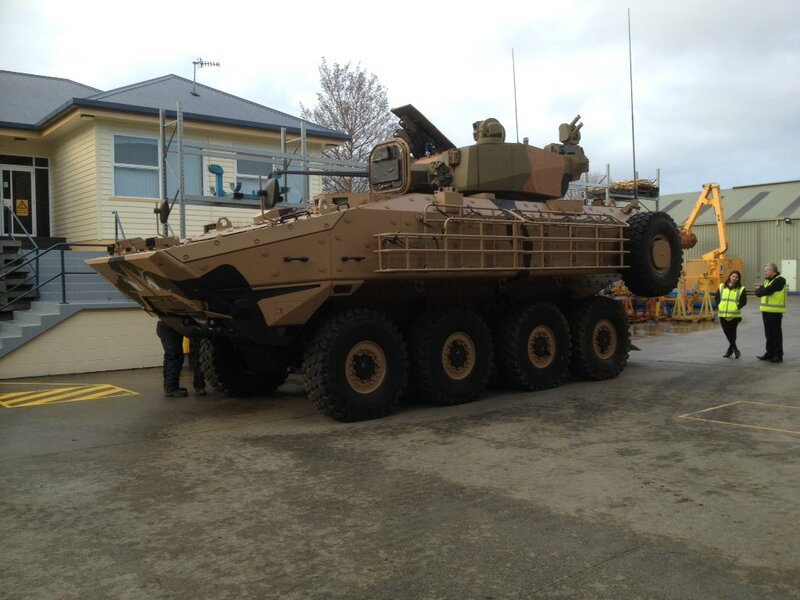 The vehicle purchased under the phase 3 of the LAND 400 project is meant to be the replacement for the M113 variants in service with the Australian Army, most notably the While it already is part of the PSM joint-venture offering the German Puma IFV for LAND 400 Phase 3, the German company has decided to make another offer with the Lynx. While Rheinmetall representatives and websites have tried their best to describe the vehicle as a new development and kept their lips sealed on the true nature of the Lynx, it is understood that this vehicle is just a heavily upgraded Marder IFV. A company now owned by Rheinmetall originally build the Marder, several hundred Marders were bought back by the industry and saved from scrapping. The Lynx is fitted with the same Lance MTS (modular turret system) turret as the Boxer CRV, however with slightly different armament. While it also includes a decoupled twin-launcher for Spike ATGMs, it was presented with a larger 35 mm autocannon as main gun and Rheinmetall's three-barreled RMG 7.62 machine gun. Unlike a gatling gun the latter weapon is fitted with three barrels to reduce barrel wear and it is possible to switch to another barrel within less than 5 seconds. Rheinmetall claims that this enables the user to switch to a cold barrel in the middle of combat, which leads to a higher accuracy and sustained rate of fire. 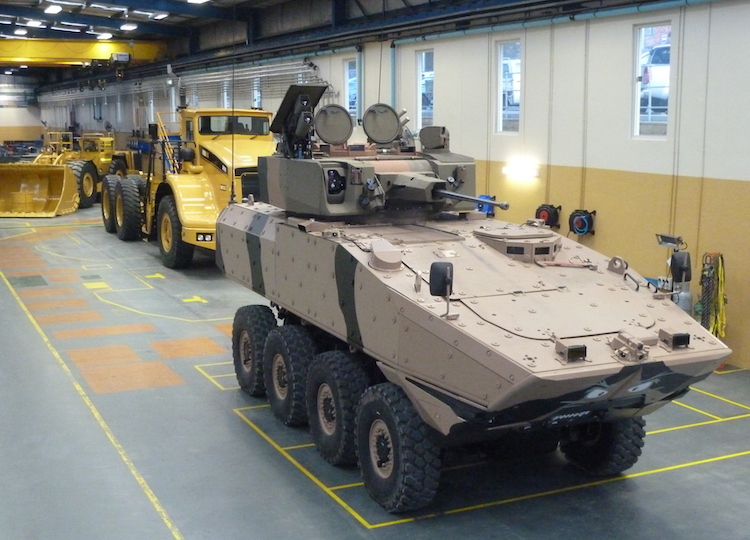 The Lynx is fitted with Liebherr engine (depending on versio delivering either 750 hp or 1,050 hp), segmented rubber tracks from DST and a NBC protection. Iversionst's armor seems to be largely identical to the late version Marder IFV (1A3 and follow-up ), which utilized spaced steel armor for ballistic protection against up to 30 mm rounds. The side armor of the Lynx appears to be different, the spaced armor and storage boxes of the original Marder 1A3 were replaced by plates of steel or composite armor. The ADS has not been fitted, but according to Rheinmetall it is an option. An interesting suggestion is creating two versions of the Lynx, one of them utilizing a stretched chassis. While as previously noted all existing offers for the Phase 3 have only a 3 + 7 configuration (assuming realistic amounts of internal storage space), the Lynx is offered as KF 31 and KF 41; the latter has a sligthly strechted hull (but the same number of roadwheels) to provide seating for a crew of three and up to eight dismounts, while the shorteer KF 31 has is designed for only six dismounts. Aside of the lower price compared to more expensive offerings such as the Puma IFV, this might be the main selling point of the Lynx IFV. In general Rheinmetall claims that the Lynx armored vehicle family is making use of a modular approach - how modular this is exactly is not known yet. While the description from Rheinmetall - speaking of separate Base Vehicles and Mission Kits- is suggesting a concept similar to the Boxer, the Lynx doesn't appear to be compatible with Boxer mission modules. It also remains questionable if it is possible to change the mission kit of a Lynx during it's lifetime without major factory-based (re)work. The Lynx will be offered as turreted and non-turreted version for the different roles of the vehicles replaced under LAND 400 Phase 3. Elbit is a publicly listed company, not state owned. The Sentinel II has a STANAG 6 kit available that not only covers the whole STANAG 6 protection requirement but does so within normal vehicle weight limits. Because the Sentinel is not burdened by the additional weight and complexity of the modular payload/module system it has a greater payload capacity than Boxer and therefore, greater capability to carry additional armour. Boxer uses its engine as part of the frontal protection system meaning that the crew may survive a STANAG 6 threat but the vehicle will be a mobility kill. Terrex 3/Sentinel can take a STANAG 6 threat and keep fighting. It should be noted that the STANAG 4 armour is installed on the 30 tonne Terrex 2 and that vehicle is amphibious in sea state 3 with a full load of Marines and gear! Sounds like the Terrex has plenty of payload! The SPIKE missile is in a suspended launcher mech that retracts into the turret and is de-coupled. Unlike the Boxer the launcher is an integral part of the turret and doesn’t protrude past the vehicle extremities as can be seen in the photos of the Boxer. The Terrex 3 hull and Elbit turret both appear to be built around the very latest AFV design thinking. Combine that with their “built in Australia” push my guess is that Elbit and STK are a certainty for RMA, question now is who else? Even though the Boxer is clearly the only vehicle that can challenge the Sentinel for technology and protection I can’t see the Australian Government choosing a platform that didn’t involve extensive use of Australian Industry. Elbit was originally founded as joint venture between Eltron and the state of Israel (or rather the military). While it has been split up into three different companies and all these are privately listed companies limited by shares (Ltd.), this actually doesn't mean that the government doesn't own the company. Rafael, IMI, IAI and ICL are all examples of privatized Ltd.'s where the Israeli government is or was the largest shareholder. As I cannot say for sure if and how much shares are still held by the Israeli government (due to lacking/inconsistent data on Elbits website and other investor websites), so I removed the statement about Elbit being state-owned. That the Sentinel II is incapable of meeting full STANAG 4569 level 6 protection was consistently reported by two Australian magazines specialized on military technology and industry, the Defence Technology Review and the Australian Defence Magazine. They even videotaped the official reveal of the Sentinel II, where an engineer from Elbit/ST Kinetics talks about how the vehicle only has level 4 protection in it's current configuration and requires major modifications (removing the turret) to be able to meet level 6. The Terrex 2 has STANAG 4569 level 4 protection at a lower weight - so does the Fuchs 1A7 at only 17 metric ton of weight. However there are some factors you ignore: Such as the size of the vehicle (more surface area = more weight required for armor), the internal components (bigger engine and heavier transmission) and the fact that there is a ~five tons heavy turret ontop of the Terrex 3. The Spike missile is not de-coupled according to the Defence Technology Review magazine, which unlike you were at the official Sentinel II reveal event and talked to officials from Elbit Systems. As for your speculations on the Boxer, some of your speculations are proven to be wrong, other are hard to prove. The "burden of modularity" is less than one hundred kilograms (the weight of a few metres cables and a few bolts, as all contenders are using multi-layered floor plating for meeting the required level of mine/IED protection. The Boxer in it's original ("A0") configuration has at least level 5 armor (not accounting the engine) according to German sources. The Boxer CRV is based on the latest Boxer A2, which has improved armor protection. 35 tons for Stanag IV seems not light either and guessing the modular upgrades will increase the weight as well.